Chunk is a project space exhibition featuring a series of new paintings and sculptural paintings by FSU Art MFA ’16 Scott Bell and FSU Art MFA ’16 Elise Thompson. The term “chunk” can refer to “a piece of something” to consume, such as cake, or a section of information built from several smaller elements. 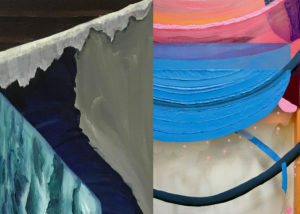 These artists inquire about notions of indulgence and desire through painting at levels both commercial and personal. Bell’s works can be read as “a love letter or a red flag.” At first glance, the assembled forms and subject matter appear simple and commonplace. Geometric shapes and velvety textures call on the recognizable, like candy that could melt in your hand. Upon closer examination, bits and stories of daily American life can be found: of longing, guilt, indulgence, and impulse. Much like our culture of persuasive advertising, the packaging in these paintings mimic the consumable; attractive image and texture triggers desire. The opening reception for the exhibition will be held at the 500X Gallery, on November 10th, and will continue through December 2nd!